Paraguay features a blend of compelling nature, such as the Saltos del Monday waterfall and Cerro Cora National Park, with fascinating monuments including the National Pantheon of the Heroes and Icono Tower. The only means of transport to Paraguay from the United Kingdom is by airplane, which will inevitably see you up in the air for at least a day. A flight from Birmingham to Asunción, Paraguay’s capital, takes an average of 30 hours depending on your airline. You should consult your diabetes team prior to leaving to assess how you can best manage your diabetes while flying to Paraguay. The time difference in Paraguay is four hours behind British Summer Time and three hours behind Greenwich Mean Time. This may require changes to your diabetes management, but any changes to your medication schedule should be discussed with a diabetes specialist. The climate in Paraguay in the summer is much warmer than that of the UK, with average temperatures of around 20°C. However, those travelling between September-May can expect blistering average temperatures of around 30°C all across the country. Hot temperatures can enhance insulin absorption, so people taking insulin should check their blood sugars more regularly. If you are planning any periods of physical activity, you could consider reducing your dosages if you are worried about hypoglycemia. The currency used in Paraguay is the Paraguayan Guaraní. Most ATMs accept major international credit and debit cards, although you may be asked to show identification if you are paying for items by card. You should seek to visit your doctor no later than two months before departing the UK to assess which vaccinations you may require before entering Paraguay. The government of Paraguay requires yellow fever vaccination proof if you are travelling from a country where yellow fever is prevalent. Yellow fever is a risk in certain parts of Paraguay, so it is recommended that all travellers over nine months of age take this vaccine. Vaccinations for hepatitis A and hepatitis B are also recommended for all travellers, while immunisation for typhoid is recommended for those planning to eat or drink outside of major restaurants and hotels. The rabies vaccine should also be considered for travellers planning activities that might bring them into contact with bats, who carry rabies in Paraguay. UK citizens with diabetes will not be entitled to any free medication services while in Paraguay. Securing comprehensive medical insurance will be essential in order to obtain even basic treatment. Diabetic medication is available in Paraguay, but payment will be required from all pharmacies, for which the Spanish translation is “Farmácia”. Blood and urine testing kits are available from pharmacies in Paraguay. The emergency services telephone number to be called in Paraguay is 131. How is blood glucose measured in Paraguay? Unfortunately, we do not have the information of whether blood glucose is measured in mg/dl or mmol/l in Malta. 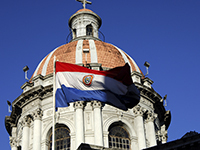 What language is spoken in Paraguay? Spanish. It will be greatly beneficial to learn some general phrases to assist in your day-to-day activities as locals may not have the best grasp of English. Learning phrases relating to your diabetes will be essential should you, or a member of your party, require medical assistance. What sugar free drinks are available in Paraguay? Diet Coke, Diet Pepsi ad Diet Sprite, among others.